Wagga jockey Nick Heywood enhanced his reputation as one of the best riders in the bush with a Wagga Gold Cup day treble. After winning the first two races of the day on Nicconita and Coup De Main, Heywood made it three when scoring on Hemmerle ($2.60) in the Wagga Marketplace Benchmark 62 Handicap (1300m). Just as Marco Man ($11.00) looked home for Tim Donnelly and Rebeka Prest, Heywood brought Hemmerle with a sweeping run to grab the hometown hope on the line. It gave Williams a double and Heywood a treble. 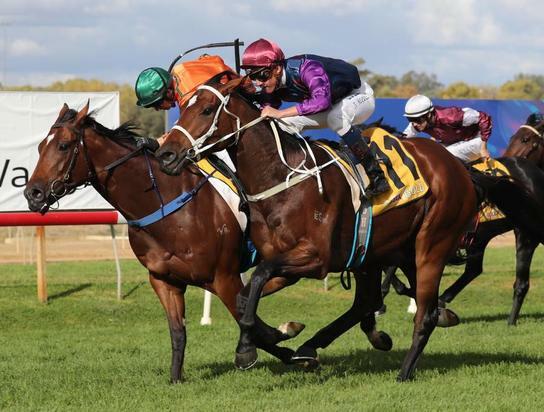 The quiet young hoop was happy to stand tall on Wagga’s biggest day of racing. “It’s always good to ride three anywhere,” Heywood said. Hemmerle won at Goulburn on debut and backed it up with a barnstorming Wagga win. Williams believes the three-year-old will only get better. “This is the mate of Coup De Main, they work together, and this is a horse that John Gamble, who also trains, has given me the opportunity to train the horse,” he said. Williams also paid tribute to Heywood, who has been riding work for him. "He's been coming down and riding trackwork for us when he can, he's a very busy young man," he said. "It pays when you have them riding work, they get to know the horse a bit and get an affinity with them. "He's riding really well, he's a good kid."